You can’t go wrong with Sacha Baron-Cohen. Dominating cable tv with the Ali G show for years, when Borat went into wide release in the states, it launched an army of impersonators and Baron-Cohen became a household name. His follow up, Bruno, was decent, but not nearly as funny as Borat. 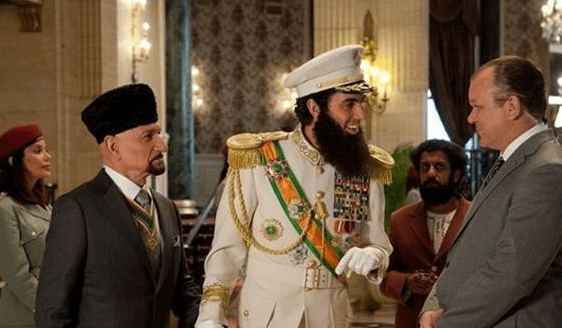 Baron-Cohen’s latest creation, The Dictator, is the story of Admiral General Aladeen, the ruler of the North African Republic of Wadiya. Under threat of UN sanction, Aladeen travels to New York to address the council. His Uncle (Ben Kingsley) who was passed up for the throne, is conspiring to have Aladeen out of the way so he can take the reigns of the country. Shortly after arriving to New York, he is kidnapped by a hired hit-man, and is replaced with his buffoon of body double (also played by Baron-Cohen). Aladeen, unrecognizable without his beard, is out on his own in New York – trying to reclaim his position. He’s helped along the way by Zoey (Anna Farris), a Brooklyn-dwelling owner of a co-op market. Aladeen could vey well be Baron-Cohen’s most offensive creation. No one, and nothing is safe, from women, to Israel and 9-11, anything and everything is made fun of by Aladeen. Is the film crude? Yes. Is the film funny? If it’s your cup of tea, definitely. The one thing that definitely bugged me was the casting of Anna Farris. I didn’t buy her as a Brooklyn-liberal-hipster. A short haircut and armpit hair just wasn’t enough of a transformation. It was great to see Baron-Cohen in a film that isn’t focused on hidden-camera or unsuspecting interviewees – not that it was ever a question, but he definitely has proved that he’s able to pull of a traditional narrative.